Here at Hume Hire, we offer a wide range of loader hire rental suited for a variety of project sizes and types at affordable rates. We carry a number of articulated front-end loader options that are comfortable, productive and operate with efficiency. Whether you are in the market for a wet hire or dry hire, Hume Hire has you covered. We offer the 19T Komatsu Front End Loader, capable of taking on a wide range of jobs. Komatsu front-end loaders are known for their comfort and the efficient way they can tackle a job, which is why they are favourites among operators. Their hydraulic and drive train technology makes it possible to take on any sized project with ease. Our small wheel loaders perform quickly, operate smoothly, are quite powerful and are operator-friendly. You can even control the traction to match your digging conditions. The mid-sized wheel loaders in our fleet are equipped with a large capacity torque converter that is powerful and will quickly fill the bucket to capacity. You can also manoeuvre easily when climbing hills, making it possible to complete projects more efficiently in less time. Other wheeled loader features include the built-in reliability and quality, high stability, operator-friendly joystick steering and high lift booms which make them easy to operate. We ensure all our wheeled loaders are always well-maintained, decreasing the risk you will experience downtime due to machine issues. We are located in the border town of Albury, so can offer unparalleled long-term rates on articulated front-end loaders and equipment throughout New South Wales and Victoria. 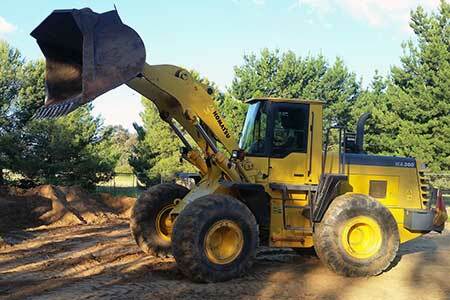 We also provide service and loader hire in Albury, Southern New South Wales, Wodonga, Wagga Wagga, Northern Victoria and Shepparton. At Hume Hire, we offer the best in loader rental at an affordable price. Customer satisfaction is at the core of what we do, so rest assured we’ll make the hire process go as smoothly as possible. Large or small, let us provide the equipment and expertise for your projects. All our equipment is kept in top working condition, ensuring reliability and safety when you need it most. Our friendly team is always here to answer questions and provide information on all of our equipment. Contact us today to discuss your plant hire needs and obtain an obligation-free quote.